I was talking with friends the other night about narrow escapes—dramatic ones, where we might not have made it but did. There were a few harrowing stories, most notably from our friend who, back in some wilder time before we knew him, used to street race à la The Fast and the Furious. He’s a pretty mellow dude these days, so I have an awfully hard time imagining this, but apparently that’s the truth. I don’t have any dramatic stories (thank God), but I feel this way all the time—like every day that I make it is a miracle. I imagine this is a more common experience for those of us who are anxious. There are so many things that could go wrong and do, for so many people, without rhyme or reason. When they don’t, I honestly feel as though I narrowly missed being hit by a bus. All of a sudden, I find myself standing in a room, going about my day, walking out in the the sunshine, and I realize I’m alive, and it didn’t have to be this way. It’s the feeling of sitting in the doctor’s office, hearing you’re okay. All of those awful things you feared would happen…didn’t. It’s like springtime, bursting forth when you’d stopped even hoping it would come. Sometimes I am struck by how deeply I experience things, how immediate and intense my life feels to me, and I cannot wrap my mind around the fact that this is what we’re all experiencing, millions and millions of us on this planet, all the time. And this is why I think it’s important to eat cake. Because you are here, and you are alive, today, right now. This particular recipe comes from the cookbook by Jessica Koslow of Sqirl fame, which is titled Everything I Want to Eat. And you know, sometimes it’s okay to do that—to eat everything you want to eat. There are times for diets, sure, but especially for the generally healthy among us, there are lots of times for no diets. There’s a big difference between eating wholesome food and some of the toxic “health” trends that sweep through the internet and our lives these days. I’m not immune to all of this, of course, so my I-can-hardly-believe-I’m-alive moments of revelation are always helpful in kicking me in the rear and reminding me that I should enjoy, as best I can, every moment of life that I’m given. And this includes midday cake, scones, elevenses, etc., which probably top the list of things that make me inexplicably happy. Koslow’s cookbook has gorgeous salads and delicious things on thick slabs of toast and also dessert, and frankly that IS exactly what I want to eat. I will take my turmeric tonic with a side of cake, thank you very much. These tea cakes remind me of my childhood, though they’re entirely different from the treat they call to mind. 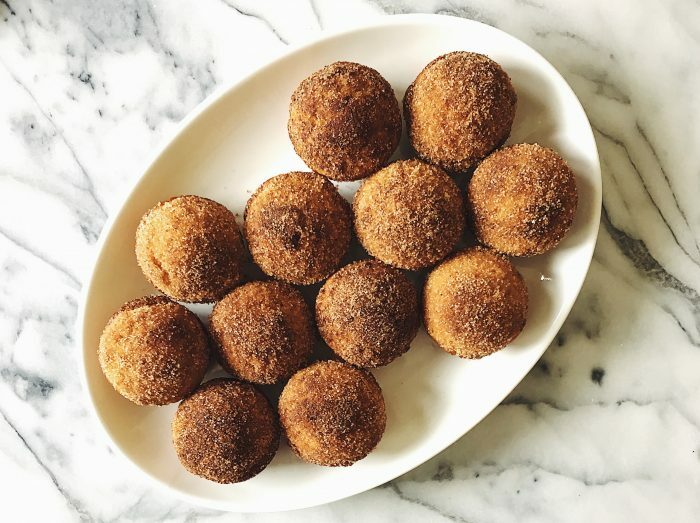 My mom baked amazing old-fashioned cinnamon-and-sugar-coated doughnuts that we all gobbled up when I was a kid. It was a family recipe, and she’d make them for my grandfather, her father, and he’d savor them, keeping them in the freezer and eating them one at a time until they were gone. I like to think of him eating those doughnuts, enjoying his life. 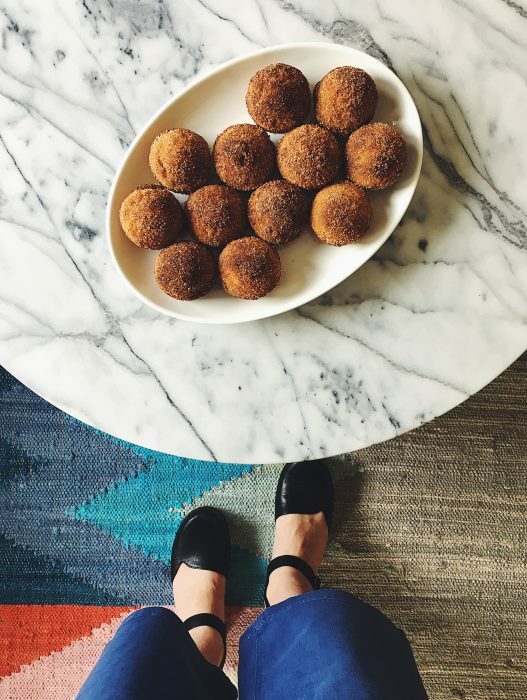 As their name suggests, these little cakes are seriously reminiscent of doughnuts. I must admit that I am not indiscriminately fond of doughnuts, but these charmed even me. They have the sugared coating of a doughnut but the dense crumb of a tea cake. They are excellent at any time of day. They will remind you that you are alive, and that this is something to celebrate. These really, truly are “doughnut-ish”—strikingly so! They are best soon after they’re made, but they last a couple of days, tightly wrapped, and reheat nicely in a low oven. Butter the bottom surfaces (not the sides) of a standard muffin tin. In a large bowl, whisk together the dry ingredients: flour, sugar, baking powder, baking soda, cardamom and salt. In a smaller bowl, crack the egg, then whisk to break it up. Gradually add the melted butter and milk, whisking. Pour the wet mix into the dry one, stirring with a spatula until just combined. It’s okay if the batter is somewhat lumpy. Scoop the batter evenly into the muffin tin, filling each well about three-quarters full. Bake until the tops are light golden brown and spring back when you press them, about 25 minutes. Let cool for a few minutes in the tin. Meanwhile, make the topping. Stir together the sugar, cinnamon, cardamom and salt. Put the melted butter in a small bowl. Once the cakes are cooled somewhat, turn them out of the tins, using a knife to loosen the sides if necessary. Dip each top into the melted butter, being sure the whole muffin top gets coated in butter, then into the cinnamon sugar. Brush any bald patches with melted butter and dip into the sugar again. These are best eaten immediately but can be stored overnight, wrapped tightly. Such great words, Stacy. Life can seem so intense and serious sometimes. Cake always helps. ALWAYS.